Somewhere in the 1930's the noted English arts writer Roger Fry made the observation that "an artwork has had its effect on us before we notice it". What he was alluding to is the fact that our conscious awareness is the last of our responses to be awakened by an artwork.It has already had an effect on our subconscious,an effect on our "flight or fight" instinctive reaction and an effect on our emotional centre by the time we get around to consciously making an assessment of it. All of these reactions go to make up the Presence of a work,in a nutshell,how much of all the artist's responses has he or she brought into the present moment ,the clearing or meeting place between artist and viewer. 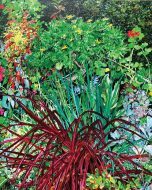 Jo Reitze gathers our attention in the moment and holds it so that we are transfixed by her"Front garden in autumn" and we are really there with her. 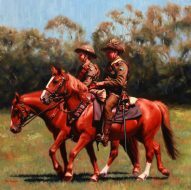 Vicki Sullivan,uses oil paint with great skill, the horses in her "Light horse wales and kangaroo feathers" come alive; we can sense their aliveness and vitality. 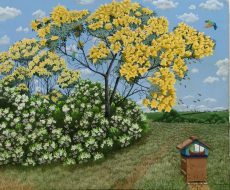 Gillian Lodge paints a sublime ideational dream world in her "St modomocs bellarine bees",the foliage and the grass,wattle blossom and bees are all painted with an other worldly dream like clarity. Robyn Pridham creates a beautifully muted abstract "Scrubby series no 2 ,which holds together with real emotional rigour,balancing on a rasors edge. 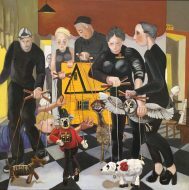 Carmel Oconnor constructs a tough whimsical piece of theatre with "Darlington puppeteers' an enigmatic space frame which holds our attention and sense of mystery. 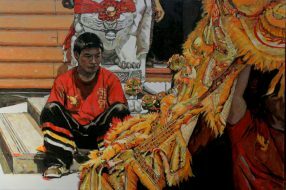 Good solid drawing and draughtsmanship lifts Sue Jarvis's "Lion dance lunar new year into the group of six works which are my choice as Highly recommended works. It is the broard sweeping energy and gusto of Susan Sambells "Timeless land 'which make it my standout choice for the Annie Davison Oliver Award. and I have chosen Jan Martins "Evening at Lakes Entrance" for the Danks Trust Award. 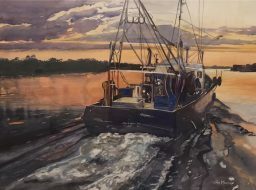 It is a fine example of the technique of watercolour being harnessed to deliver a real emotional charge to the recording of a sublime boating moment in the sunset at Lakes Entrance. Annie Davison Oliver Award - Susan Sambell Timeless Land. Danks Trust Award - Jan Martin Sunset, Lakes Entrance. The Danks Trust Award has been gifted to honour a MSWPS member for her dedication to art and to acknowledge her high standard of achievement in her work. It is awarded to encourage, reward and foster excellence in individual artistic pursuits undertaken by our women artists. Annie Davison Oliver was a long serving Treasurer and Benefactor of MSWPS. Her death in 1997 at the age of 94 ended a long and valuable association of 67 years. In appreciation, MSWPS established this award in her memory. Elizabeth Moore Golding Felicity, City Woman and Sue Jarvis 9am Swanston Street will be presented with this award donated by Carolyn Yong in memory of her mother at the Christmas Lunch. 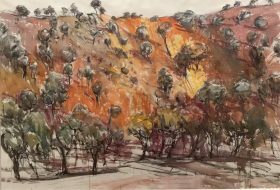 In 2016 Melbourne Society of Women Painters & Sculptors had Annual exhibition in two parts with both forming MSWPS 107th Annual Exhibition. We are delighted that our first show was held at Chapel on Station Gallery in Box Hill. Members were invited to respond to the theme “All things Bright and Beautiful”. This Hymn title was chosen because it referenced the location of the gallery in Box Hill Baptist Church as well as expressing our endeavour to brighten up the greys of winter. The Danks Trust Award for the best work in Show was judged by Jacquie Nichols–Reeves, the Curator of Whitehorse Arts Space. Malvern Artists’s Society Gallery was host to Changing Perspectives with the Official Opening on August 12. The Official Opening was a wonderful evening. The gallery was full of members, friends and family and there was a buzz of excitement on the arrival of the Governor of Victoria. The Honourable Linda Dessau AM is the first female in this role. Amongst her numerous distinguished legal and community appointments, the Governor was formerly a Trustee of the NGV. In her eloquent and engaging address, the Governor clearly revealed her great appreciation of the Arts. She acknowledged the wonderful heritage of the society and showed an understanding of the difficulties that women artists encounter in juggling the many aspects of their lives. She also informed us that she was able to select works by several Australian women artists from the NGV collection to feature in Government House.